Most of us use a front camera on our laptop or tablet just for video chatting on Skype. However, camera on Windows devices can be used for much more than that, if you use it combined with the right software. So, we found 10 camera apps for Windows 10 that will help you use the full potential of your webcam. All apps from this list are perfectly compatible with Windows 10, but most of them work just fine on older versions of Windows, as well. All these programs have something unique to offer, so depending on what you want to do with your webcam, you can choose the right program for you. Most of these programs are free, but some also have premium versions, as we tried to cover all available options. Check out our list of the best video recording and image capturing programs for Windows 10 below. What is the best software to use on a webcam in Windows 10? ManyCam is perhaps the most recognizable program on the list (and the best, in our opinion), as it surely is among the most popular ones. This tool is arguably the best virtual webcam software that’s offered for free. Although it can’t be compared with YouCam 7, feature-wise, it still offers a handful of usable options. The best thing about ManyCam is the fact that this tool is very flexible, as it supports many programs and services. So, you can integrate it as a camera source for Skype, make gaming footage with the Game Capture feature, it also supports YouTube integration. Another great thing about this program is that you don’t even need an actual camera to record video. You can use an Android app called ManyCam Mobile Source, to connect your Android device with ManyCam, and use its camera as a webcam on your computer. ManyCam is available for free, and you can download it from this link. Additionally, this software also has the Enterprise and Pro versions, with even more features. 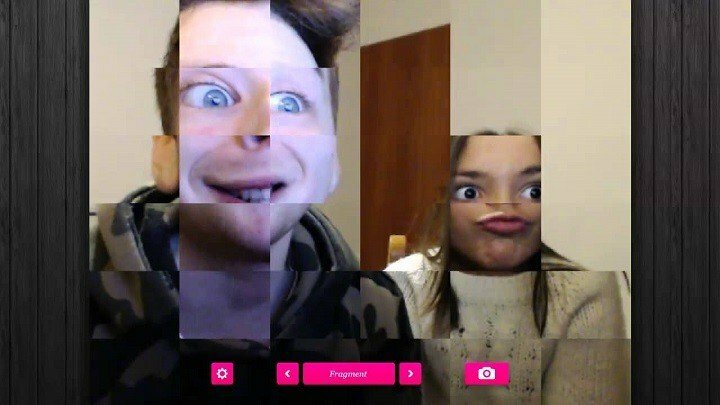 CyberLink’s YouCam 7 is one of the most feature-rich webcam apps for Windows 10. You can use CyberLink’s software for basically any video recording – capturing of images, videos, or even for video surveillance. Unfortunately, CyberLink doesn’t offer a free version of this software, as there are two options: Deluxe ($44.95), and Standard (34.95). Update: the free version has been launched and can be downloaded from the link below. But you shouldn’t be skeptical about paying for YouCam 7, because the software was developed by CyberLink, which is one of the biggest, and most reliable companies in the business. Of course, the features list varies in these two versions. Logically, the standard version offers less features than Deluxe. As for the features, recording is, of course, the main purpose of this program, but it also offers a huge variety of effects. You can add various funny effects, frames, screens, filters, and even emoticons. It also features a full-fledged video editor, to polish your videos even more. There’s even a surveillance mode, to keep an eye on your home cameras while you’re away. 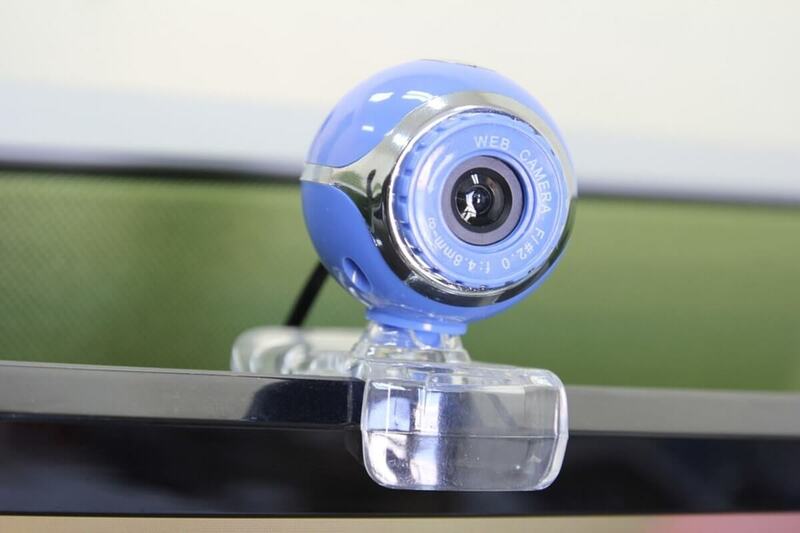 Logitech is one of the most famous webcams manufacturer in the world. Therefore it is reasonable for the company to have its own webcam software. So, if you have Logitech’s webcam, probably the best option is to use its webcam software, as well. With this software, you can capture images and record videos from your system’s webcam. It also comes with a few additional options, like the ability to adjust camera’s sensitivity, or to enable motion detection. Logitech Webcam Software also have a surveillance mode, good for your home cameras. 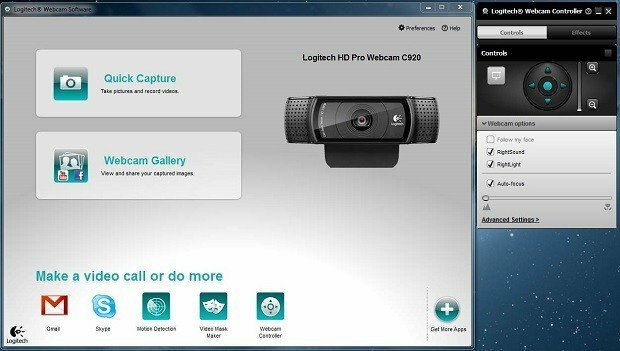 You can download Logitech Webcam Software from this link. 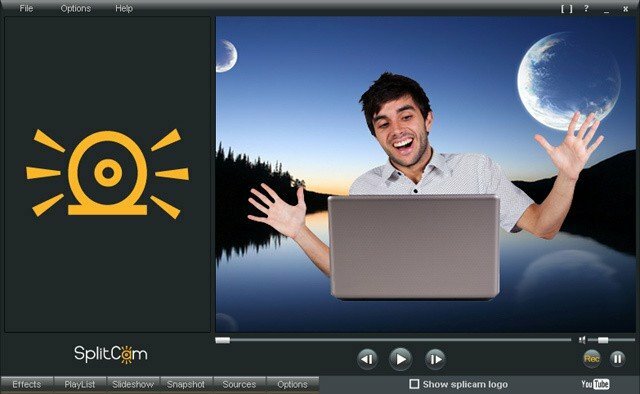 Yawcam is another free tool for capturing images and videos with your webcam. It is very simple to use, but that doesn’t mean it lacks some good features. 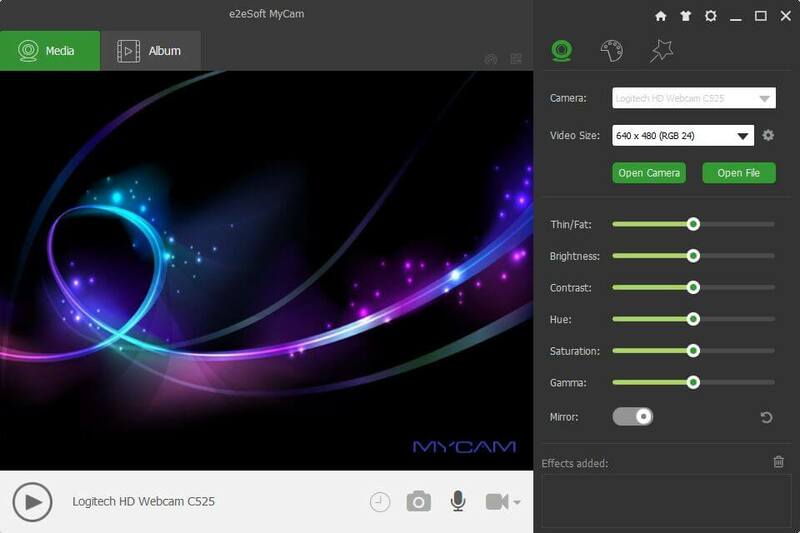 On the contrary, Yawcam contains a great set of features, that you can use to enhance your recordings. With Yawcam, you can capture regular video recordings, but you can also stream your video online directly. This is good for YouTube recordings, and Twitch streams. It also has a great combination of motion sensors and a surveillance mode, which makes this software a good option for this purpose, as well. Additionally, there are some more features, like time scheduling, and taking snapshots. 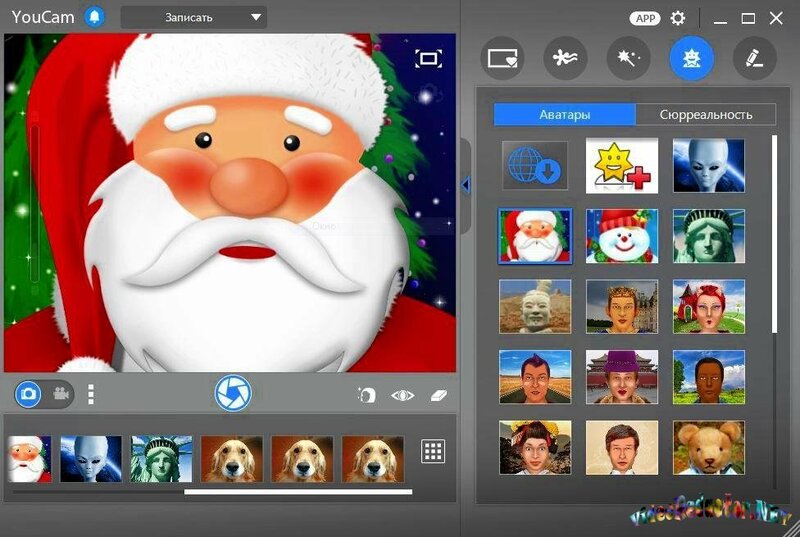 User interface of Yawcam is so simple, that you’ll be surprised how many features it has to offer. But at the end of the day, it’s a good thing to have many features packed in a simple UI. You can download Yawcam for free from this link. SplitCam is a free video-taking software, recognizable for the number of features it has to offer. This software is also great for streaming, so you can use it for capturing quality online content. SplitCam also allows you to add effects into the output video, and supports various resolutions, so you can choose the best possible quality for your recordings. Apart from that, SplitCam has a huge offering of various effects and filters, so you can further enhance your video with these additions. SplitCam also has the ability to add 3D masks to your video, which certainly is a very nice touch. There are also some more benefits, like the ability to work in the split screen, integrate the program with various streaming services, and more. 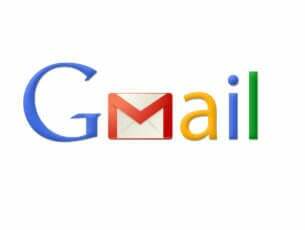 It also works with the majority of communication software, so you can use it as a source in these apps, as well. So, if you need a free, but still feature-rich webcam software, you should definitely take SplitCam into consideration. If you want to download SplitCam, you can grab it for free from this link. Windows 10 has its own camera app, and we simply have to mention it. 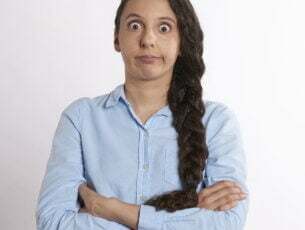 Not because Windows 10 camera is better option, or offers more features than third-party programs, but simply because a lot of people prefer Windows’ built-in tools and apps, over any third party solution. So, if you don’t want to install any additional software, but still want to use your camera properly, you should definitely stay with Windows Camera. When it comes to features, Windows 10‘s camera app definitely isn’t the best one in this field. It contains some basic features, but still can’t compete with the best third-party options. Actually, when you open the app, you’ll only see two buttons – capture and record. So, you can either take a picture, or record a video. Of course, you can open settings, and add a few adjustments, like adding a framing grid, or reduce flickering, but once again, features are very basic. Windows 10‘s default camera also works with the majority of communication services, so if you’re using your webcam just for talking with your friends/family, you basically don’t need any additional options, so the Windows 10 camera is actually a solid solution. The main purpose of IP Camera Viewer is home surveillance. This is the best software to connect all surveillance cameras in your home, and track them all at once. IP Camera Viewer supports the huge variety of webcams, so it can represent an affordable solution for putting your living or working space under the sight of cameras. IP Camera Viewer has a very neat, and simple to use interface, so you shouldn’t have any problems working with this tool, even if you have multiple cameras connected. Speaking of multiple cameras, IP Camera Viewer supports over four cams at the same time, so you can basically cover your whole house. As you probably noticed, almost every software from this list has a surveillance mode, but none is as advanced as IP Camera View’s. So, if you want to transform your computer into surveillance cameras hub, IP Camera Viewer is the only program you’ll need. If you want to download IP Camera Viewer, you can do so for free from this link. Debut Video Capture Software is not your regular video recording program. The main purpose of this software is screen capturing and recording, but it also has a lot of options for customizing the video output form your webcam, even better than some apps which purpose is solely that. Because of that, we decided to put this program on our list of the best webcam programs for Windows. 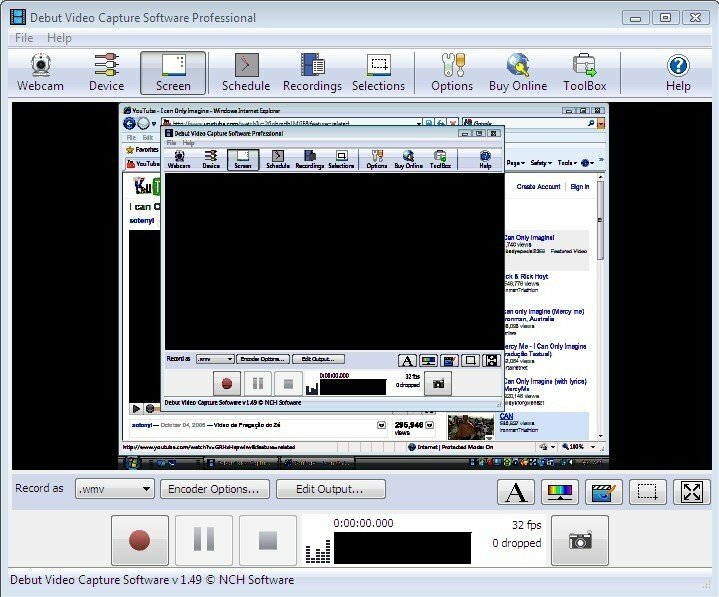 This program lets you capture videos (both from screen, and from your webcam) in various formats, including VI, WMV, FLV, MPG, MP4 etc. This tool is so versatile, that it even allows you to capture videos from external sources, like IP webcams, for example. In addition to this, Debut Video Capture offers some more handful features, like mouse highlighting. Debut Video Capture is probably the most useful when you’re recording gameplay or tutorial videos for YouTube. It basically allows you to do the whole job in a single program, by by both screen-capturing, and recording from your webcam. If you want to download Debut Video Capture Software, you can do so for free from this link. It also has a premium version, which is available for the price of $49.99. Webcam Toy is not an actual webcam software, but a web-based tool for recording video and capturing images. The main advantage of this tool is the fact that you can access it from any platform because it’s browser-based, so it doesn’t have to be Windows 10. However, Webcam Toy is a very simple tool, that doesn’t offer that many features. Basically, it’s just a web-based version of Windows 10‘s built-in camera app, just with a few different features. You have a few basic options, like dual mirror & upside down, but that’s pretty much it. To use Webcam Toy, you just need to access the website, permit the access to your webcam, and start recording. No registration is needed. If you want to try out this too, visit its official website. 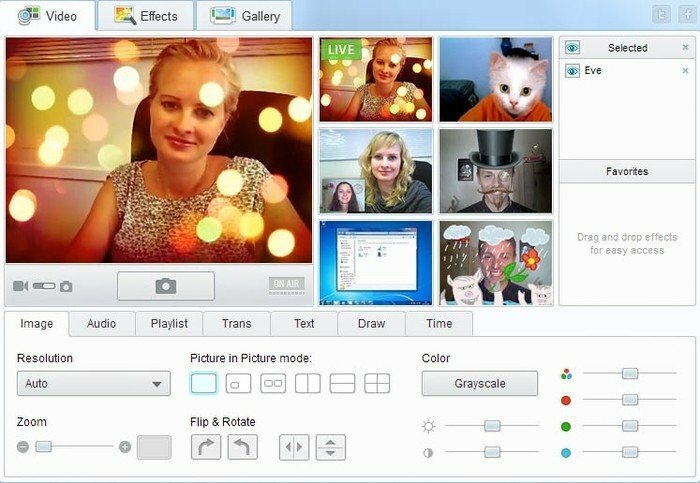 This is an amazing tool that you can use on your webcam that will allow you to take pictures, record videos and apply various filters and effects. MyCam is easy to use and it also lets you share the content you created with your mobile phone. 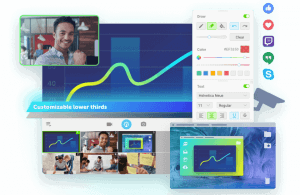 A great feature that you could use while having video conversations via your webcam is the possibility to create MP4 or GIF files that you can share with your friends. It also creates a dedicated album to stock all your videos and pictures. This tool has a free version that you can use, but it will leave a watermark on your files. In order to unlock more features and get rid of the watermark, you will have to purchase a license. That’s about it for our top ten picks for the best webcam software for Windows 10. 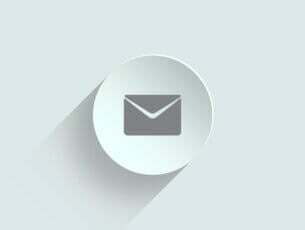 We offered you various options, so you can pick one that suits you the best. Let us know what you think about our choices, or if you have some tool to add to the list, in the comments below.